This week we take a look at the post-war Middle East both at Versailles and after. I want to start off by saying that this is not the only time we will discuss the decisions and actions at Versailles as they related to the Middle East, however I did think it was appropriate to add an overview onto the end of our episodes covering the events in the Middle East. Many of the topics and themes touched on in this episode will be covered in greater detail later this year. Perhaps more than any other area in the world, the decisions made by those at Versailles would have the longest lasting effects on the Middle East. There were decisions that still haunt us today, and which will not be resolved anytime soon. When we look back at who was making these decisions the spotlight has to fall on the British, of all of the nations who participated in the discussions at Versailles none had a larger influence on the Middle East than Britain. During the war they had made many promises to many people and at Versailles and after they would have to try and come to terms with all of those promises, some were made to the Arabs, a good amount of lip service had been paid to the United States and their crusade for self-determination, there had been agreements with the French and Russians, and then there were all of the British imperialist aspirations. Trying to balance all of these commitments would be difficult, and it would not go well. While countless discussions were happening in Versailles and Paris, there had also been discussions happening in the Middle East in the last years of the war. 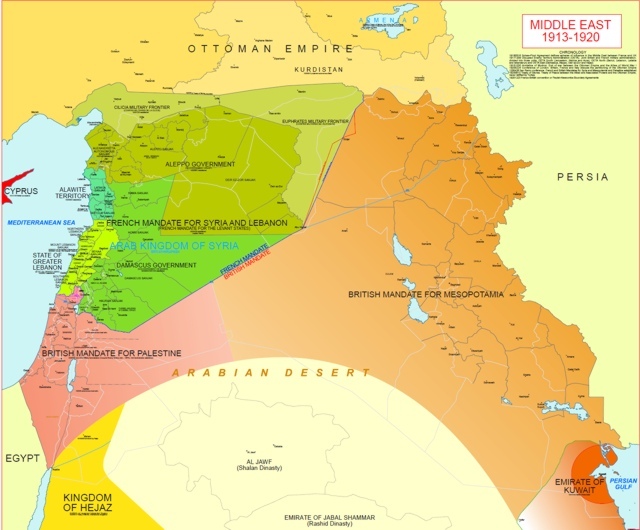 Throughout 1918 and 1919 all around the Middle East groups had begun to organize and solidify their own political platforms, often based around the idea that the Middle East should be able to make its own destiny. These actions increased as news of President Wilson's 14 points spread throughout the area and many nationalist groups latched onto these points, and the British and French acceptance of them, as a way to gain their freedom. These hopes would then clash with British and French goals in the post war world. They had purposefully added a lot of ambiguity, at least publically, into their promises for self-determination and what precisely the European countries came to do was always shifting, and this lack of concrete answers just raised hopes in Syria and Mesopotamia, which would come crashing down. At Versailles the conversations were a mess, for reasons we will discuss in greater detail in later episodes. The biggest problems arose from the promises and deals that had been made between the allies and other groups. Often these promises clashed and at times they were completely contradictory. They were also making decisions about areas over which they had little knowledge, and onto this plate of ignorance was added increasing concerns about oil in the Middle East, and topic that had only recently entered into the calculations of the European empires. At this time oil was only flowing from the Persian oilfields, but there was a widespread belief thtat there were large deposits in Mesopotamia as well, beliefs that would prove to be true in 1927, and with the growing reliance on oil of the economies around the world, and for the British the Royal Navy, securing control of this resource was deemed a critical strategic imperative. All of these problems resulted in two different sets of issues. The first was the competing claims of the European nations which we will discuss first, and then there were the views of the people of the Middle East, which we will discuss after. The British ended the war in control of more territory than any other nation at Versailles and their prime objective was to hold onto as much as possible as negotiations continued. In this the British were led by Lloyd George, his nation was war-weary and in the midst of a fiscal disaster, but he continued to believe that Britain should play a dominant role in the post-war Middle East. He based his arguments, at least in part, on how much the British had done in the theatre during the war. Over the course of 4 years of conflict 2 and a half million British troops had served in the Middle East at some point, and 250,000 had become casualties. To balance against this the French had done little outside of Gallipoli and the Americans had not participated at all. Then they were able to go back to that whole occupation thing, the British, and their associated Commonwealth and colonies, had over a million troops in the Middle East and they represented the only non-indigenous military force of any size. To try and help smooth over some issues with the French and Arabs the British invited representatives from both groups to sign the Anglo-French Declaration of November 7th, 1918. This declaration renounced colonialism based on annexation which, at least on paper, showed that the British and French supported some form of self-determination. However, the British were well aware that there were many ways around these type of restrictions, and self-determination could easily be circumvented, or manipulated, and it would be. While the British were showing that they were in a position of strength, and that they could still fulfill their traditional role as the greatest colonial power in Europe, the actual situation was somewhat different. By november 1918 there was little support among the British people for continued economic and manpower investments in the name of colonialism. In the army there was even less support and as soon as the war on the Western Front was over the troops started to demand demobilization. In late January 1919, 5,000 British troops at Calais would mutiny to demand demobilization and soon there was an even more aggresive demobilization plan put in place by Winston Churchill, the new Secretary of State for War. Churchill would also promise to drastically reduce military spending, saying "I shall do my utmost to secure substantial reductions in military forces, for without those reductions good finance is impossible." He would fulfill this promise by cutting spending from 604 millino pounds to just 111 million pounds in his first 3 years in office. This left the British in an incredibly weak position militarily, and unable to assert themselves by force. This military weakness was then joined by problems on the homefront, which I am just going to use a very lengthy quote from Peace to End All Peace by David Fromkin to describe. "Management and labor, each trying to maintain its wartime gains even though the economy was shrinking, turned to industrial warfare a month after the election. Violence broke out. The government took counsel with the army and naval chiefs of staff on measures to suppress what they—haunted by Bolshevism—feared might be a working-class revolution. In 1920 and 1921 the British economy collapsed. Prices collapsed, exports slumped, companies went out of business, and the country was gripped by mass unemployment on a scale never known before. Politicians began to question whether Britain could afford foreign policy adventures in places like Palestine and Mesopotamia and began to question whether she could even afford measures that were designed to buy social peace at home. The Prime Minister had espoused a positive Liberal program of housing and social reform—in large part, it was in the hands of his principal parliamentary leader, Dr Christopher Addison—but he was driven to abandon the program, and Dr Addison, in the face of Tory attacks on government wastefulness. Yet it had always been Lloyd George’s view that “the way to prevent the spread of the revolutionary spirit was to embark at once on large schemes of social progress.”19 In his view, to give up such schemes was to leave the door open for agitation and violence; yet that is what he did rather than abandon his imperial ambitions in the Middle East. It was against this background of a disappearing army, a deteriorating economy, and a disintegrating society that the Prime Minister—a man who had worked miracles during the war—concentrated on redrawing the map of the Middle East and of the world, while Winston Churchill, unheeded, continued to warn that time was running out." While the British were not in the best position to push their claims by force, Lloyd George still hoped to do so diplomatically. To this end he planned to shine focus on what the French and Italians wanted in the hope that this would divert American attention in that direction, instead of towards what the British hoped to gain. The Italian side of the plan would work the best. In our next set of episodes, starting next week, we will discuss the events on the Italian front and how they clashed with the Americans after the war. For now it is enough to say that the primary problem was the types of promises that had been made to the Italians to get them to join in the war. They had been promised territory around Trieste, in the Balkans, and most importantly for our current story, territory in the Ottoman Empire. And that territory was in Anatolia. This expansion was purely imperial, there were no Italian communities that the Italians could claim to be protecting, or any ethnicity or group that they would claim to sponsor, they just wanted more territory. Unsatisfied with what they were being told at Versailles the Italians took the matter into their own hands and in March 1919 they landed troops in southern Anatolia. They were there, obstensibly, to restore order, but in reality they were just there as a show of force. As the Italians stepped up this show of force Wilson threatened to send in the American navy and even began to discuss the possibility of going to war with Italy. The Italians were becoming a problem, and several possible solutions were discussed, and one of these was to get Greece more involved. Greece was nearby, and was certainly willing to gain any brownie points with the other countries, and so on May 15th Greek troops were landed at Smryna, where the Italians planned to soon land troops. Much like the previous Italian landings the reason given for these troops was to maintain order, but in reality the troops were sent to show the Italians that the Allies were serious. This proved to be the final straw for the Italians, and it was part of the reason for a confrontation between Wilson and Orlando which would result in Wilson standing his ground and Orlando backing down. This failure, and the forfeiture of so many Italian territorial ambitions would result in Orlando being forced to resign. These types of failures would then be used by Italian extremists afte the war, who would point to how the country had been betrayed by their former allies. with the Italians out of the way the British then turned against the French. They had to take a much more delicate hand with their more powerful ally, but it still involved using Wilson and the Americans. This new confrontation revolved around French claims in Syria. The British put forward Feisal as the obvious choice for a ruler of a free Syria, playing up his and the Arabs role in taking Damascus and in the campaigns of 1918. Wilson believed that the Syrians should be able to choose, and Feisal was able to get on Wilson's good side quite easily. The French, seeing that their influence in Syria would fall away with Feisal in charge, produced their own candidates for the position. With the British and French unable to agree, Wilson had a somewhat radical idea. And this is really crazy so stay with me here. Wilson wanted to send a commission to Syria to find out what the Syrians wanted. Pretty crazy, right? I'm sure this caused the French and British politicians quite the chuckle, at the very least they never took it seriously. Much like many other of Wilson's ideas, they did not hinder it in anyway since they knew that they could just ignore it later, and until then it made Wilson happy and kept him busy. When the commission completed it was ignored, and over the next 3 years the representatives would debate on how best to confluce their peace with the former Ottoman empire, it would take all the way until 1922, and another conference in Cairo, before peace would finally be concluded but before that would happen there would be events in the Middle East which would greatly change the status quo. Much like every other theater during the war, 4 years of conflict had ravaged the Middle East. It had greatly disrupted the social structure, displaced hundreds of thousands of citizens, and forced economic hardships on the entire region. This made many citizens far more accepting of movements that moved against traditional political powers. This was coupled with the revomal of all of the ottoman structures of power after the war, which gave nationalist groups a nice power vacuum in which to organize and prepare. Around the Middle East this resulted in several different actions. In Egypt it resulted in protests among Egyptian troops, who by the spring of 1919 had still not been demobilized. A few weeks later, after there were no changes, the troops officially went on strike. Allenby, still in charge of British troops in the theatre, would write that "I can’t shoot them all for munity; so I must carry on as best I can, and I must resume demobilisation." These protests did not stop, and after they had been going on for over a month Allenby was forced to write to London in late May 1919 that "There is great unrest and discontent in my army, and, in the case of the administrative services, unrest verges on mutiny." The mutinies in the military were not the end of the protests in Egypt. What had begun as demands for independence near the end of the war was given a definitive voice by all of the rioting and mutinies of 1919. When this was combined with the weakness of the British and French militaries, frantically trying to demobilize and cut expenditures, there was a perfect storm for the Egyptians. Here is Kristian Ulrichsen from First World War in the Middle East "Egyptian nationalism as espoused in 1919 thus differed fundamentally from its pre-war guise. Exposure to, and participation in, the war facilitated the fusion of economic and political demands that gave greater depth to nationalist platforms and popular support. As noted by Albert Hourani, the defining legacy of Egypt’s participation in the war effort was the transformation of Egyptian nationalism from a movement largely of the educated urban elite into one that could command the active or passive support of a broad cross section of socio-economic groups." Egypt was not the only area where this type of movements occurred and in Afghanistan, Arabia, and Syria similar movements took place. For Egypt, this resulted in the Anglo-Egyptian Treaty of 1922 in which Egypt was made a sovereign independent state except for in four area ‘the security of the communications of the British Empire in Egypt’, ‘the defence of Egypt against all foreign aggression or interference, direct or indirect’, ‘the protection of foreign interests in Egypt and the protection of minorities’ and ‘the Sudan'. All of the unrest across the region led to the Cairo Conference in March 1921. It was here that the British leaders came together to try to, once and for all, fix the mess of promises and treaties that had not been wholely resolved at Versailles. This meeting also had a very different atmosphere when compared to the meetings in 1919. While many of the broad strokes of the previous agreements were held, the French in Syria the British in Mesopotamia it also had to involve local leaders and sought to get their agreements to the new arrangements. The most important of thes would be Sharif Hussein, Feisal, and Abdullah of the Hashemites and Abdul Aziz ibn Saud from Arabia. It was under these men that the Middle East under British control was divided. Feisal in Iraq, Hussein in the Hejaz, Abdullah in Jordan, Abdul Aziz ibn Saud in the heart of Arabia. In most of these areas the new rulers were on shakey footing. In the Hejaz they would have to work with the growing strength, and ambitions, of ibn Saud. In Iraq Feisal had to deal with ruling an area where he had no tribal or familial connections, in in which he was only in power due to a plebescite. The results of that vote was questionable to say the least. His dynasty would be overthrown in 1958. The only one of the areas that is still under the same family as set forth in 1922 is Jordan. This area, at the time called Transjordan, would have just two monarchs between 1921 and 1999, imparting a level of stability seldom seen in any monarchy. This played a part in making Jordan one of the most stable countries in the Middle East for almost a century. Even to this day, now ruled by Abdullah II, Jordan is officially known as the Hashemite Kingdom of Jordan. At the end of the Cairo Conference, and after so many changes and alterations, the British and French still, in many ways, got what they wanted. Sure it was structured differently than they originally imagined, but they both still had their little spheres of influence, and in those spheres they had at least some control. 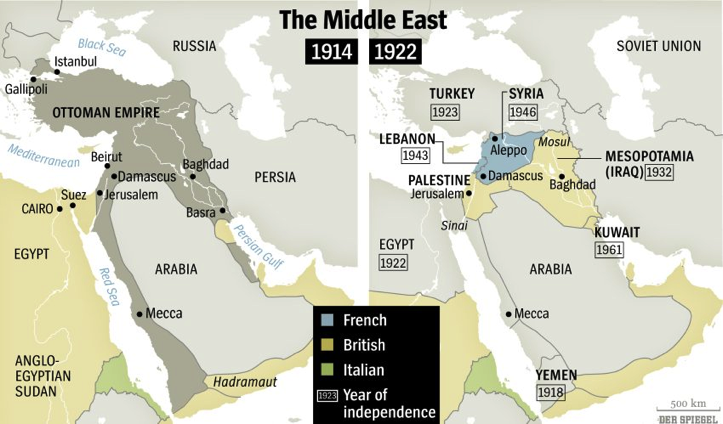 The legacy of the First World War in the Middle East is one of violence and instability. The borders that were created were almost at random, the meddling in who ruled whom caused friction for generations. In Peace to End all Peace David Fromkin would say "The Middle East became what it is today both because the European powers undertook to re-shape it and because Britain and France failed to ensure that the dynasties, the states, and the political system that they established would permanently endure." In many ways this seems to be a failure that the Western world has not learned anything from. You can expect far more discussion about the postwar situation in the Middle East, and its lasting legacy, in later episodes. Thank you for listening and I hope you will join me next episode as we begin the final chapters in the war on the Italian front.